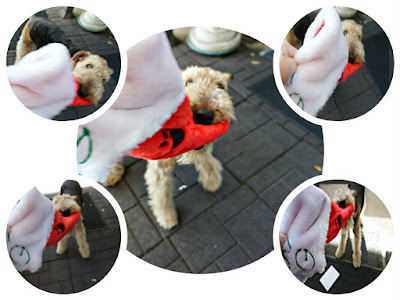 Ruby the Airedale: Pressies from my Boo! she says she's tryin' to gets into the groove of things. Mint Cookie Crunch for YOU! So, she is gonna do a few post catching up from the last month. PRESSIES FROM MY BOO MURPHY! Yes, my STUD MUFFIN sent me a most FABulous STOCKING full of goodies! He sent a most lovely cardie! Furst I had to fight Ma for my stocking!! Ma finally gave me what was inside....a TOY! what are these??? they smell delish! And a hangie thingie for my wreaths! Then I FINALLY gots to taste those TATER STICKS! I loved all my pressies, and sleep with my bear. Chicken coated sweet potato?! yummmmmmm Murphy took good care of you, Ruby! What a great pressie package Murphy sent you. We hope your mom feels better soon. Healing kitty kisses to your ma's head Ruby. OMCs your Stud Muffin Boo knows the direct route to his Cherry Bomb's heart is through food and toys. You got sweet tater treats too Yummers x 2. Wow! What great presents! Hooray! If you take the fifth, it was probably tequila. I am so glad you loved your pressies. Did you notice I kissed all over them? Tonight my love! Feliz Naughty Dog....bwahaahaa! SHE's got Feliz Navidad playing in HER head at the moment. Chicken coated sweet potato. We're droolin' here, too! That Murph is such a good shopper. Boy, that Murphy sure knows the way to a gals heart!! That is SO SWEET! Murphy sure knows how to treat that special girl in his life!!! Those were some awesome gifts, Ruby. YOur Boo sure knows how to treat a lady well!!! Hope Mom is feeling better - those migraines are awful. We hope your mom feels better. My grains are no fun. 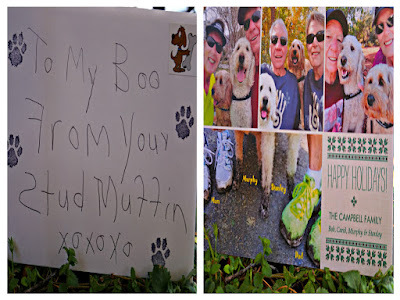 Murphy really did pawsome for Christmas! Great gifts!! Murphy is a keeper! We had a late Christmas too. Our Mom had the flu, so Santa waited till she felt better. He's a nice guy. SWEET TATERS you gots SWEET TATERS why that is better than ice cream. You know with the Chinese New Year it is the year of the dog, yep it will be our year. WooHoo. Pray your Mom feels better. Such pawsome pressies, Ruby. Sorry your mum has been plagued with headaches, etc. Hope she's feeling better. Here's to a furbulous 2018...the Year of the Dog! Your Murphy is a great prezzie buyer. Glad you had a good Christmas, Ruby. Sorry about the migraines, hope they go far away! You hit the jack pot of treats I would say.